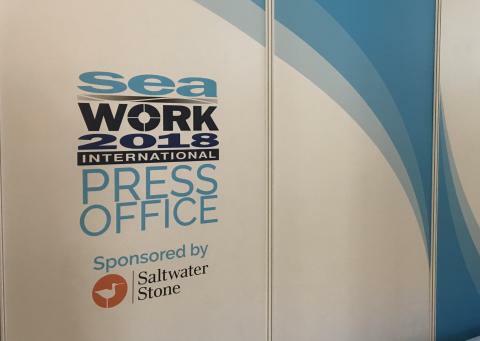 Saltwater Stone has announced its continued commitment to Seawork International by sponsoring the event press office for the sixth year in succession. 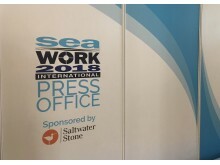 Saltwater Stone, the maritime PR and communications specialist, has announced its continued commitment to Seawork International (11th – 13th June 2019) by sponsoring the event press office for the sixth year in succession. The show, which will take place at Mayflower Park, Southampton, is expected to be bigger than ever with over 10,000 products and services on display, making it the largest commercial marine and workboat exhibition in Europe. Each year Seawork International attracts visitors and exhibitors from around the world, making it the ideal event at which to showcase products to a global market. As a UK-based agency with a worldwide reach, Saltwater Stone is the perfect fit to support the press office for this leading European event. The Seawork International press office acts as a communication hub where journalists can source leads on new products, schedule interviews and report on the exhibition, conference and the European Commercial Marine Awards, held at the event. It is managed by exhibition organiser Mercator Media’s in-house PR team. Commenting on the sponsorship renewal, Saltwater Stone Managing Director, Georgina Bartlett said: “As a specialist PR agency operating at the heart of the maritime industry, we have attended Seawork International since its inception more than two decades ago. Over those years it has thrived and grown to become one of the most important annual commercial marine and workboat events in the world. Saltwater Stone has a global selection of clients exhibiting at Seawork International 2019. These include ACR Electronics, Coppercoat, Cox Powertrain, Dometic, Fischer Panda, Ocean Signal and Raymarine. From its UK offices in Poole, Saltwater Stone delivers a full range of communication and creative services for all maritime sectors, with specific focus on PR and media relations, media intelligence, and design for online and print. Informal meetings will be available with the Saltwater Stone team during Seawork International for any exhibitors or visitors looking for new ways to communicate with their customers and the media. The agency’s latest Yearbook, which features a range of its most recent campaigns, will also be available at the event. To schedule a meeting with Saltwater Stone, please email enquiries@saltwater-stone.com or call +44 (0)1202 669244. Saltwater Stone is a PR, design and communications consultancy delivering compelling strategic solutions to leading maritime brands. Offering integrated, full-service marketing support on a national, European and global level, Saltwater Stone can be engaged as a press relations partner, media planning agency or creative hub. Saltwater Stone has been a central force within the global maritime industry for over 27 years. From cutting-edge technology and ground-breaking products to new boats and industry exhibitions, its 12-strong team has experience covering the entire oceanspace and beyond.